I think I know my way around Hoboken, but I keep getting lost looking for grocery stores. Last Thursday, when I got off the bus from upstate NY, I decided to take advantage of the Thursday Senior Citizen discounts I’d discovered at a local supermarket the previous week. It was a nice day; I needed a walk, and I knew approximately where the place was. I decided I’d use the opportunity of this walk to drop in on the offices of a young man I met when apartment hunting – the realtor who’d shown me the place I didn’t take in October. I walked over toward the river (the Hudson, to you Alabamians reading this) which is where I had remembered the market. 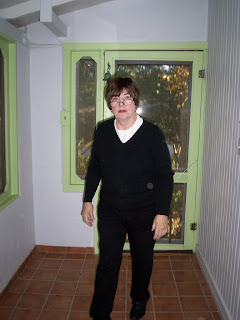 I walked past the beauty salon where I’d gotten my hair done – subject for another blog post – three weeks ago. Dragging my trusty shopping cart, I went down past the post office where I have bought stamps and sent packages. No grocery. I knew it had to be over there somewhere, but I couldn’t find it. In some desperation I turned and headed west, but before I knew it I was on the famed Washington Street and knew I was going the wrong way. Never mind, the realtor's office was just a few blocks from there, so I headed that way to ask my new young friend where the store was. When I arrived at his office I was greeted warmly and given directions. After exchanging pleasantries and directing him to my blog, I retraced my steps back toward the river and found the place. Within a few days it was time for more food. This time I decided to go to the A & P, in hopes of better prices than the other place, which, even with its discount, was way more expensive than I had come to expect in Alabama. It seems everything's except schools organic here, and that means pretty prices. I had been to the A & P twice, getting lost the second time. I know where it is, I swear I do, but if you come at it from the wrong side you can't see it. I know that sounds crazy. I know I don't have the best sense of direction in the world, but getting lost time and time again just isn't like me. I have trouble picking out landmarks in Hoboken for some reason. The main drag, Washington Street, is easy enough to find but there is a sameness even to the look of this town. Uptown and downtown, the buildings look alike. Maybe I'm too used to using azalea bushes or magnolia trees as landmarks, I don't know. Because on Saturday I couldn't find it again. I realized I'd gone too far west when the cliffs of Jersey City -- the Palisades -- loomed close. I turned around and looked carefully on both sides as I walked back over the familiar streets (which all look rather alike). Finally I saw a couple of teenage boys who looked like they knew their way around. They told me to go one block over and two blocks up. Sure enough, I came upon the back of the building, just as I had the other time I overshot my goal, and went inside to get groceries. I spent very frugally, coming in under $30, but in the line I remembered that what I really wanted was Craisins and I hadn't gotten them. Craisins, if you read my food blog you'll know, are my downfall, and the elegant "dried cranberries" in the organic food stores just don't have that chemical crunch and acidity that Craisins do. I have to walk all the way to the A & P to find them, and then I never remember that that was what I came for in the first place. This means I'll have to go to the A & P again soon, if I can find it. I'm told there is a Shop-Rite somewhere the other side of the A & P, but I have yet to see it. All this exploring is interesting, and I'm learning too. I keep in mind that you have to get lost a little when you're finding yourself. It's officially not Christmas any more, so why do I still hear so much Christmas music? Not to be a curmudgeon. I really enjoyed Christmas this year and the runup to it. But now that's gone, as gone as I am from Fairhope and Alabama, so why is the media behind this curve? Can't they let go? I had a trip to Kingston, New York, where I found a gangly grandson who turned 13 right before my eyes and his ten-year-old brother still begging to open presents all through our carefully wrought seafood dinner on Christmas Eve. I had an idea how to cope with the incipient adolescence of the former, and the latter always wins me over with a bat of the eyelashes on his big, deep-blue eyes. My daughter's friends always give me pleasure, and this year there is a new member of her team, a rock-and-roll singer from Mississippi with a boatload of charm and a desire to make friends with her mother. All bathed me in the spirit of Christmas -- loved ones, soon-to-be-loved ones, and one big day to eat, drink, be merry and secretly contemplate the meaning of it all. Yesterday in the rain I boarded a bus from little Kingston to the Port Authority Bus Terminal, from there to hop the bus to Hoboken. The two-hour ride from Kingston was boring until I eavesdropped on the man across the aisle advising his seat mate, a young actress on how to build her career. "It's not what you know or what you can do," he said. "It's who you know. Do you know who Danny De Vito's roommate was in college?" As a matter of fact, I did, but I decided not to get in on this one. I thought right away of One Flew Over the Cuckoo's Nest, the movie young Michael produced, with a painfully young Danny De Vito in the cast. Then I remembered that at one point Dustin Hoffman, Gene Hackman and Robert Duvall roomed together. I couldn't recall any of them helping each other out, but maybe they did in early days. I thought of Marlon Brando; he once roomed with Wally Cox. I don't think this payed off for either of them with much of anything. Yet his advice was not bad, and the conversation was certainly none of my business. It helped the time pass, and traffic was slow going as we neared the Lincoln Tunnel. We seemed to take a little duck into New Jersey, because we had passed the huge malls in Paramus where the monster Macy's, Crate and Barrel, and Ikea stores are. The trip through the bus station to the Hoboken bus was a breeze. I've done it lots of times now. I bought something so I'd have exact change, waited with a little group for the bus, and was in my apartment some fifteen minutes after boarding. It's a miraculous little trip. Now I'm home. Now I'm waiting for a delivery of the furniture I bought last week. My cell phone and IPod have been recharged. Now I'm waiting for some checks in the mail so I can pay for stuff. Now Christmas is behind me and I'm looking forward to the new year. Sometimes I'm glad I'm not officially a movie critic. The debut of the new film Sweeney Todd starring Johnny Depp is one of those times. Much as I almost literally adore Johnny Depp, I'm going to pass on this one. A friend of mine observed that I don't like musicals, which really isn't true. I love Carousel and Guys and Dolls and Gypsy and Company and ever so many others. I know revealing this list dates me, but so be it. When the Brits came into town with the "revolutionary" first musical on roller skates, I thought it a fluke and haven't liked very much since. This means I don't get excited about anything by Andrew Lloyd Weber or really much of anything that comes from across the pond. I was particularly repulsed by the idea of Len Cariou and Angela Lansbury doing a Victorian song-and-dance about murdering people and baking their remains into pies. When I lived in Geneva, I was thrown with a lot of Brits, for whom the tale of Sweeney Todd was a deliciously evil delight. It was a straight stage play -- apparently an old chestnut in England -- before it was made into the musical that has now been embraced by the dynamic duo of Tim Burton and Johnny Depp. I am enraptured by Johnny Depp, both the man and his work, and have been from the first moment I laid eyes on him as the bizarre Edward Scissorhands. An actor with extraordinary gifts and a decidedly offbeat tendency to pick challenging and difficult roles, he is to be admired for taking this one on. And according to experts who have seen it he and his director are up to the task. They make more of the material than anyone else would have dared try. It's just still not my thing. I'll watch clips and excerpts, but I'm not one for such dark and frightening works, and I have no doubt these two guys would scare the socks off me. I wish them all the best this time, but they'll take the trip without me. I'd be more interested in the entertaining Charlie Wilson's War, with Tom Hanks, Julia Roberts in a ridiculously unflattering wig, and Phillip Seymour Hoffman. A trio of the best actors and most appealing movie stars (almost up there with Johnny Depp, as a matter of fact). Based on a book by the late George Crile, it's about the U.S. Congressman in the 1980's who funneled money to the resistance fighters in Afghanistan and the people who surrounded him. With this cast, it can't help but be a delight to view. Now, nothing against the state of New Jersey, mind you. It's just that I'm living here now, and I'm in a state of shock. I have to admit it; there's nothing remarkable about denial. I made a decision to move here and acted on that decision. It's the move itself that has brought about a shock to my state of being and my life. And I like it. I live by the philosophy that change and challenge are vital to life. Some change is sad, even tragic, some disappointing. I'll warrant that. Finding the way to use disappointment as a path to growth is neither fun nor easy and not always productive. On the other hand, making what appears to be a difficult but positive decision without a great deal of deliberation produces a shock to the whole system. That's where I am now. A lot of the adjustment of moving to a new place is adapting to processes and procedures. Instead of going to my car and driving 15 minutes to an hour to get somewhere I need to be I put on a lot of wraps (a usually-unnecessary step in the previous climate) and walk about ten minutes to the train or five to the bus (where I might have to wait ten minutes). From there I am conveyed to a place within a short walk of where I want to be, so I walk some more. Yesterday the weather was better -- it warmed up to the low 40's -- so I decided to go to Manhattan to buy a sofa. I did a little research on the Internet (Googling "New Jersey Furniture Stores") and found that the nearest furniture store to me is two and a half miles away, on W. 23rd St. The ones in New Jersey were at least 15 miles away and would have required a transfer or two by bus. I was on West 23rd in 20 minutes. I found just what I wanted -- a classy showroom, a smooth salesman, and a sofa and chair I liked within my budget. I bought it and made arrangements for delivery December 28. The whole excursion took a little over an hour. And I was in New York, walking through the crowds, negotiating the lights with the little man striding to tell you it's your turn to walk (as long as you take big steps). (In Hoboken, some of the lights give you a countdown -- flashing 10, 9, 8, 7, and so on as you run to make lift-off without getting lifted off the street by a whizzing car.) City life is exciting. Little by little, I'm getting stuff accomplished like learning which days to put out the trash. I tried to put a couple of cartons on the street last night (knowing tonight is the official recyclables night) and they were ignored, so I carried them back upstairs to avoid a fine or other police action. Gradually, like Alice perhaps after a little time down the rabbit hole, I find myself changing. Even my way of writing is changing, as I see, editing this. I'm using more commas, more semicolons, more parentheses. I am still cautious. I must still be in shock. I am certainly in a different state of mind. I learned something yesterday: Just because it's too cold to go outside doesn't mean you can't go outside. The day before, it was snowy, slushy, grey and cold. Besides, it was Sunday and I had laid in supplies the day before. I looked out the window and decided I just would stay in all day. This meant that I had to make a decision around 3 P.M., because I had been looking forward to a presentation of Christmas carols at the R.C. Church of Sts. Peter and Paul just a few blocks away. An old fashioned carol-sing, with only the beautiful old ones about angels and shepherds and the baby in the manger, held great appeal for me this year of change in my life. I hoped I would hear "Bring a Torch, Jeannette, Isabella" and "Lullaby of the Christ Child" along with the merry "Deck the Halls" and "Joy to the World." But I thought about it Sunday afternoon and realized I wasn't up for it. I would literally be travelling out of my comfort zone -- my warm apartment, my funky clothes -- and into what I wasn't entirely sure. I elected to stay in and watch my new television instead. Yesterday the sky had cleared and the temperature was 33° at least. I saw a young woman walking past my building with neither hat, gloves nor scarf, and she didn't look to be cold. "How can she not be cold," I thought -- and maybe she was cold, but she was hiding it very well. Maybe, unlike me, she's acclimated. Maybe it's time I worked on that. I had business to attend at my bank, five or six blocks away, and that girl didn't look cold, so I bundled up and went out. I stopped by the grocery, which is one of those expensive gourmet ones, and spent more than I should on a few items, but I learned that I can do it. I expect to go out today to do my laundry and tomorrow it's going up to the low 40's so maybe I'll go swimming. Anyway, this is a lesson I'd learned years ago, when to capitulate to the weather and when you just do what you gotta do. The New York Times says pretty much the same thing in an opinion piece this morning, so I must be on the right track. (Already I'm learning to gauge my intellect on whether the Times coincides with my own views; I must be adapting. Everything is different here from the things that had become everyday to me in Lower Alabama (aka L.A.). So far, so good. I always thought I was pretty good at change. There's a major storm system in the Hoboken area. Now is the time to face the reality of my life change and explain how I'm coping. It hasn't been all that hard. I didn't make the move on an impulse, even though it took everybody, including me, by surprise. I have lived in this part of the country before, and I remembered the need for wraps, layers, mittens, scarves and hats as well as umbrellas and snow boots. The cold hit the second day I got here, and snow came gradually, giving me time to beef up the wardrobe of layers of clothes necessary to travel in the cold. And today, snow and slush are all over the sidewalks. By nighttime there might be a good deal of ice. So I'm staying inside. I keep my eye on the weather forecast which says it won't go above 40 until Wednesday. I'll mostly stay in, going out only for trips that are absolutely necessary. Luckily, the cable guy came yesterday and hooked up everything, including the television set I bought the day before. Therefore I have already had a visit from Charles Osgood and the Barefoot Contessa and Nigella Lawson, as well as those designer guys over on the Discovery Home Channel and Chris Matthews who helped me catch up with all the politics I've missed over the past two weeks. Unpacking is a challenge. I can't put the cartons out on the street until next Thursday night (I missed last Thursday by my own fault; in the meantime I've filled my apartment and the halls on all floors with stacks of cardboard and newspapers. I've tried to arrange my furniture and leave paths between those stacks of trash to simulate the cozy home I hope to have, some day, some way. It's become increasingly clear to me that I won't be in this particular apartment more than the one year for which I've signed the lease. Maybe the Fairhope house will sell before then and I can look at putting that money into a condo or at least upgrade to a classier apartment. In the meantime, this is a nice enough place, with closets big enough for the tons of unpacked cartons I have yet to deal with. I like the location, I like the layout, but of course I need a bigger kitchen and a classier bathroom -- and a real bedroom would be nice. (I'm sleeping in what's known in brownstone language as "a hall room," 5' x 10', which holds a single bed and my laptop and not much else. Of course there is a nice living room and a decent sized but less than inspiring kitchen. All this makes me think the parties for which I used to be rather famous will not happen until I move. But never mind; I don't know anybody to invite yet anyway. The reality is that everything takes time. I'm old enough to know that; don't remind me. In a year my life will be very different. That's what I like about this choice. In my previous life, I knew exactly what to expect each day would bring, and I came to know what the rest of my life would be like. And I didn't like the picture very much. It made me feel old just thinking about that. Not that I feel young, exactly, but I don't know what lies ahead. That's reality for me. To say that there's a Frank Sinatra cult in Hoboken is rather like saying that the citizens of Washington, DC, take an interest in politics. They love the guy here! Last night was the first-ever Frank Sinatra Idol contest, held at the Hoboken Historical Museum in honor of his birthday. Being the first, it was notably small, cozy, and hilarious, with an enthusiastic crowd (including yours truly) shrieking, stomping, clapping and sometimes whistling for the sometimes tentative performers. Emceed by Hoboken's smooth Sinatra imitator Gary Troy Simpson, who claims he's also known as Rev. SimpSinatra (couldn't prove it by me; I'm new in town), the show was a great amateur display with flashes of brilliance and occasional professional pipes coming from unexpected places. There was a well-placed Sinatra-lookalike sitting down center who stood at an angle so as to expose his well-rehearsed facial reactions. The folks behind me kept saying, "Look at that guy! He looks like Frank!" A studious little man who looked as if he could be an officer at a bank sat in front, visibly cringing from time to time and I kept wondering what he was doing there. The mayor and his wife came in fashionably not-quite-on-time, and were seated in the front row. The room had a party atmosphere, just as The Chairman of the Board would have wanted. I had half-expected this contest to be something like, "Who will be the NEXT Sinatra?" but I was one of the few in the room under 70, so it was more like Old Home Week for Old Hoboken. A lady started the proceedings by presenting a poem she had written about how much she and everybody else loved Frank Sinatra. Then the first performer got up and gave us a rendition of "You Make Me Feel So Young," followed by a few other numbers, with excitement building as the repertoire widened to include "Night and Day" and a couple of versions of "New York, New York." Some of these guys could really sing, but nobody sounded much like Sinatra. We didn't think we'd found a real winner until a young Hoboken Parks Service employee named Joe Riccardi, with his little fedora and his perfectly phrased pauses, got up and sang a swinging "Nice and Easy." He and another performer credited their mothers -- who were in the audience -- as their inspiration for learning to sing like Sinatra. Both were excellent. In fact, the contest ended in a tie which made it even more fun. There had to be a sing-off to settle it. A great write-up of the event, with a video, can be seen here. One more thing about the bank officer in front of me. He got up to sing and blew us away. He said he wasn't a Sinatra imitator, he had just come because it was Frank's birthday. He sang "My Way," with a beautiful, trained voice, a professional style, and an ease in front of the audience. I've tried to find him on the Internet, because I busted him when he sat down, "You're a professional, aren't you?" and he admitted it. He said, "I'm not here to compete, I just wanted to sing one for Sinatra." His name is James Michael, and I don't know where he came from, but he made my night. As you can tell, I had a wonderful time. It's interesting how many Italian men love to sing. And if Hoboken is any example, they want to sing like Frank Sinatra. My friend Ronnie, who wrote the play The Street featured in a theatre festival in the city last summer, called yesterday and invited me to join her at a cabaret performance. It seems one of "her" actors was performing in a theater below the restaurant "West Bank." I was busy unpacking and the opportunity disarmed me a bit. After all, this is pretty much what I came here for -- unpacking you can do anywhere! There is a very convenient bus from Hoboken to Manhattan, and it stops less than a blog away from the West Bank. I had to dress up but asked Ronnie if it would be okay if I came in the only shoes I seem to be able to wear on my nail-less toe, my old soft Keds. She graciously said that it doesn't matter what you wear in New York any more. I dressed and put on makeup and hoped nobody would notice the footwear. The train ride was a breeze. I was early and wandered around the restaurant looking for Ronnie, thinking maybe she'd changed since I saw her in June. I noted that people did wear lots of different styles, but all black. I was in a subdued magenta, but luckily I was seated early so nobody saw the shoes. Ronnie was late. The actor, the talented Jonathan Whitton was already into his second number. I was enjoying his poise and beautiful singing style. He likes drama, and he does frankly gay material. I got a big kick out of his version of "A Little Brains, A Little Talent" from Damn Yankees, especially when it came to the line about "George Washington slept here, but it never says who was beside him!" What an image! After the show Ronnie and I visited a bit and I discovered I was going to have to pay my way for this. I thought, with her knowing the actor, she had an "in" and the house would waive the cover charge and the drink charge. Wrong. It's clear I'm going to have to increase my entertainment budget if things keep going like this. But I wouldn't have missed the show for the world. I watched the smooth young man, and thought, "I could do that! This is a nice room...let's see, I could do "Ladies Who Lunch" from Company, and began planning my act figuring how to fill the house, pay the costs, etc., when I remembered something vital. I can't sing. But this is why I moved here, after all. I can dream big. Christmas officially came to Hoboken last night when the mayor lit the Christmas tree. Children sang, politicians shook hands, and now there is a big tree lighted in front of City Hall. I missed the ceremony, but was there in spirit. It was Christmas already for me because the movers brought my stuff in the morning. Four sturdy guys cussed and fussed as they brought about 20,000 cartons, small and large, of the stuff that has meant my life for the last 20 years (and some time before) up three flights of stairs to my new home. Now comes the unpacking and wondering why I'm keeping all this crap. But by sundown yesterday I was already exhausted. I've felt more Christmassy this year than in my recent memory, and I didn't need the official ritual to bring the season home. Besides, my toe hurt. And I had been up and down those stairs entirely too many times that day. It was all I could do to stay awake until 8:30, but at least it was on my own bed in my own room. I tried to set up the bed frame by myself, but couldn't. So it was a mattress on the floor, complete with fancy new linens and lots of hope that things are on the way to getting better. Along about 7:30 a little miracle happened. I heard lots of chatter and squealing coming from the street. I knew it must be carolers! I looked out the window and there they were, little ones and grownups, about 20 of them I'd say, and they formed both a brass band and a chorus. They stopped at a house across the street. They sang Hark the Herald Angels and Silent Night, and played a couple of nice carols on their horns. I loved it. I even forgave them "Frosty the Snowman." Everybody from Fairhope sympathizes with me about the cold weather. But this kind of cold adds to the feeling of Christmas, with God throwing in a few snow flurries as if for punctuation. Hoboken is dressed for the holidays, and for once I'm glad Frank Sinatra made so many Christmas albums. Next week I'll travel to upstate New York to visit the daughter and grandsons for the actual holiday. In the meantime, I've got more Christmas than I expected. And it's doing me good. My first exposure to Cyrano de Bergerac was the film of the play starring José Ferrer. I was about 12 years old when I saw it, and I was swept away. Ferrer’s theatrical style and magnificent voice so superbly suited him to the role that all my life I had never really been able to imagine anyone else playing it. I saw the film again on television a few years ago and felt the whole production held up very well; even though it was made as a showpiece for Ferrer, on a low budget with actors to match. A broad actor, and a heavy one at that, he refrained from what is known in the business as chewing the scenery and fleshed out the large-nosed poet with heart and soul. I realized how much the play itself really moved me when I enjoyed Steve Martin’s rendition of the part in his adaptation of the play to the movie Roxanne in the late 1980's. I had only seen one live production of the play, at the Alabama Shakespeare Festival about 15 years ago, starring Greg Thornton. They did a nice job of it. I’m beginning to think the play may be actor-proof. But the version I saw at a matinee Sunday was so superior to any experience I have had with the play – and just about superior to any experience I’ve ever had in any theatre – that I must share it with you. The translation varied slightly from the one I remember with Ferrer “And, as I end the refrain, thrust home!” became something like, “At the end, I hit,” but it was servicable and in some magical way, Kline made the language his own, as if the lines had not been said before. Usually in such a grand, old-school kind of role, the actor chosen has a rich and mellifluous voice (this gift can be a burden as well). Kline doesn’t have that kind of voice. He has a good voice, a stage voice, but not a stentorian one. His greatest stage gift is probably his combination of looks, agility, and intelligence. We understand what he is saying and we believe that he is this other-worldly creature with an unreal face and a heart the size of the moon. And he is funny, brilliantly hilarious actually, while at the same time modest and touching. Jennifer Garner brought a contemporary charm to the role of Roxanne, a role usually little more than an accessory from which to dangle the plot. Garner was up for all the major scenes and, although as beautiful and elegant as any Roxanne could be, she seemed more three-dimensional and appealingly real in this production. Chris Sarandon had a rather good time with the evil Comte de Guiche, and Daniel Sunjata was effective as the hapless Christian de Neuvillette. In plays such as this, probably thanks to my years of attending Alabama Shakespeare Festival productions, I have become accustomed to seeing black actors in the period roles. Sometimes this works very well, as was the case with the casting of John Douglas Thompson as Captain Le Bret. Here is an actor who can take stage in any role -- dynamic, powerful, elegant and sympathetic -- as he holds Cyrano’s secret to the end. And Conchetta Tomei, always in character and always “in” the scene, made me at times forget it wasn’t a play about the duenna. The set was one of the most magnificent creations I have ever seen. Boasting a tall staircase at the rear, stretching from stage left to stage right and going right up for a good 100 feet, it was flexible as both interior and exterior. In one scene there’s a chandelier which rises and drops; in another the moon is as big as a Greyhound bus; in another a tree which Cyrano actually climbs, and the next time we see the tree it is horizontal in a besieged castle. In the last act the tree is dropping elegant red leaves in the abbey where Roxanne has consigned herself. I could tell you every scene, but if you’re in New York before January 8, maybe you can get a ticket and see for yourself. If not, rent the movie with José Ferrer and join me in collecting Cyranos for a lifetime. At the end of the performance we were giving them all the standing ovation they deserved, and tears were falling out of my eyes as I was thinking, “They nailed it! They nailed it!” Then Kevin Kline hushed us once again to tell us this performance was going to raise funds for Broadway Fights AIDS. Then he left the stage saying, “I’ll be back,” and Jennifer Garner explained that actors would be in the lobby collecting donations, selling signed posters for $100 each, and the cast had decided to auction off Cyrano’s nose, (autographed) with a starting bid of $400. Kevin Kline returned with the proboscus removed and signed it. Jennifer Garner kissed it, and Kline mouthed, "Now it's really worth something!" There was soon a bid, then another, and the damn thing went for $1,500! Not only did I see a performance of a lifetime, I was in the audience with a lot of high rollers. An unforgettable Christmas present to myself. Hoboken is a busy place; full of young people scurrying, talking on cell phones, pushing strollers, smooching in public, laughing, drinking, for all the world looking as if they're excited about the next thing that will happen. And then there's me. Things began to lighten up yesterday when my PIN number arrived in the mail. Now I had a little change in my pockets, a little time on my hands, a little less stress about how long things were going to be this way. I knew I couldn't hold out with only one pair of jeans, so I took myself over to that gorgeous mall to shop for a few things. Came back by Light Rail train with heavy bags but a light heart -- new clothes and a new set of sheets for the bed that will arrive Monday. I even bought Martha Stewart's featherbed to make my sleeping arrangements more luxurious and comfy. The replacement for my deflating-inflatable bed was waiting for me in the vestibule. Delighted to get it, I was nonetheless apprehensive about hauling the big, unwieldy box up the winding brownstone staircase alone. I won't describe what that experience was like except for the panic as I pushed the large carton up the stairs one by one, always mentally admonishing myself, "Don't let it fall on the toe," as well as "Don't let it slide backwards, on top of you." It was an ordeal but I did it all by myself. I was empowered. Besides, I got the first full night's sleep since the hotel in Jersey City. Then off to check emails and get a glass of wine at Mikie's Squared. Dr. Oz (Oprah's doctor) says to have a glass of red wine every couple of days. Besides, the bartender at Mikie's is a blogger and I wanted to meet him. Unfortunately I didn't catch him yesterday. But I had a bought quiche I could actually heat up in my oven -- delicious -- and a magazine or two to skim before bed. Then, wonder of wonders, this new bed didn't deflate, and I slept all night. This morning I've got a wash in the place called "Wash on Wash," a name I'll explain later. Monday is getting closer all the time. A friend from Fairhope emailed me the other day about this blog. He helped see me off and snapped some pictures trying to capture that "done-with-Fairhope" look. Before I saw the shot, he said I looked like was a "dear in the headlights, sorta." Now I know that was a typographical error. At least I think it was. At any rate, it's a more attractive picture than a deer being stalked and about to meet his maker. A fraught ML, looking over the debris that used to be her home and feeling in her pocket for the airline ticket that will take her away. At the time I thought my furniture would be in place by now. As it happened, the move took two "pods" rather than one, and the second one is still in Atlanta as far as I know. It's scheduled to be unpacked and delivered to my Hudson Street address Monday morning. Yesterday I went to City Hall, an awesome old building in which it's easy to get lost in the maze of staircases, looking for info about public transit. I was directed to NJTransit, which is downtown a few blocks, located in the beautiful old train station. I loved having an excuse to explore the train station -- plus, I did get maps, schedules, and a look at the bus terminal from which buses are dispatched on a regular basis to NYC. Since I was downtown I decided to look for the Italian deli said to make "the best homemade mozzarella you will ever put in your mouth," a recommendation from that friend I made on the street on my visit in June. The deli was in lunch mode, and the aromas emanating therefrom were heavenly -- if heaven is (which I think perhaps is so) being allowed to eat Italian food for eternity. I asked for homemade mozzarella and the guy said, "Sure," spearing what looked to be the white, cheesey body of a large rabbit and holding it up for me. "This too much? I can cut it for you," he said. Accustomed to the little shrink-wrapped Wisconsin-made knobs of mots I could get in Alabama supermarkets, I was laughing when I asked for half that amount. I could not wait to get it home. But I had my wits about me enough to ask where I might find the Antique Bakery. The boys behind the counter lit up. "It's just around the corner!" they said, gesturing, Italian-style. I left that place a happy dear (not in the headlights). At the bakery I bought a loaf of whole-wheat bread, better than I used to make when I lived in Alabama and made my own because it was not available anywhere else. Lunch from the Soup Man, and home to eat it where I could at least sit down. Then, realizing the PIN number was still at least a day away, I took my plastic eight blocks away to the A & P and bought some $60 worth of basic groceries. I still have $15 cash, and now I have enough food for a week. I hope the PIN number comes in the mail. Today. 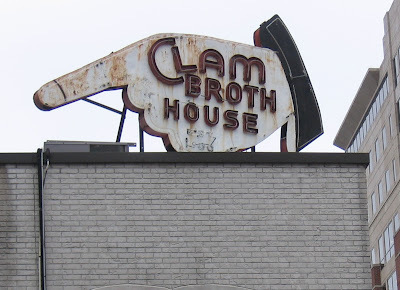 I love the Clam Broth House sign. I hope it stays there forever. Never mind that the Clam Broth House itself is no more; the sign is such an evocation of a past time in Hoboken, with that index finger pointing (now rather obtusely to The Cage, a relatively new entity in Hoboken, a gay bar), and the lettering so old-fashioned, a three-dimensional comic-strip from the Old Days in Hoboken. I'm told that the original Clam Broth House gave away free clam broth as a promotional gimmick. On days like today, with the temperatures in the 20° range, I can imagine many a dock worker made his way a few blocks over to imbibe the warm nectar of bivalve. While there he probably extended the order and shelled out a couple of bucks for a heap of pasta too. A newcomer, I'm still discovering the little pockets of old and new Hoboken -- a new pocket being the sweet little Internet café where I'm writing this. Smells of warm breakfast and just a few people at the tables, it's almost like a room in my own home. It inspires me to catch you up on my Hoboken adventures, and from here, the Hoboken Gourmet Company, I'll be writing and checking emails until I can get hooked up at my apartment three and a half blocks away. I had a great lentil soup for lunch here two days ago, and will again. But I must try The Soup Man, too, just across Washington Street. The Soup Man is owned by that infamous soup entrepreneur described unflatteringly by Jerry Seinfeld so many years ago. I'm sure he's a nice guy -- and I know I'm gonna love his soup. No move goes without a hitch. As I described yesterday, some of the hitches this time I could have done without, but I eagerly await the arrival of my PIN number (the bank says it could actually come today or tomorrow!) and then my furniture next Monday. Today I walk my frozen way down to City Hall and see what I can find out about the bus system so I can get to the Shop-Rite. I know where the A & P is; it's a long walk and the Shop-Rite is a bus ride. All of this is vaguely familiar. I lived in New York for some 20 years, and this is like a low-key return. I don't even object to the Christmas carols being piped in everywhere this year. It feels like Christmas; it's so damn cold. Oh, no -- now they're playing Burl Ives singing "Have a Holly Jolly Christmas." Some things are just too much. Ives always said he never liked kids, and it showed. I'm hoping Frank Sinatra will sing "Silent Night" next. For that, I'll stick around. Let's see, the song has changed...unfamiliar, definitely not Sinatra. Not bad, not as offensive as "holly jolly" but I think it's time for me to pack it in and make my rounds. More on finding myself and finding Hoboken. Maybe even tomorrow if they'll let me back in this place. Wonder if the Soup Man is wired for Wi-Fi. I was going to say “Sleepless in Secaucus” because it works so well, but I'm not in Secaucus. I'm in Hoboken. After picking up a few basics at Target Saturday morning I made my way to my apartment in Hoboken in the middle of the day. I had ordered a new kind of rollaway bed, one that inflates automatically once it’s plugged in. It seemed a better idea for guest accommodations than a convertible sofa, and would make do for me alone until my furniture arrives. I unboxed the bed, plugged it in, and it magically became a full queen-sized sleeping machine. Then I plunged about Hoboken – shopping for the little things to equip myself for living, enduring the cold blasts of winter tempered by moments in overheated buildings. I had a light repast at the Greek restaurant on the corner and slogged seven or eight blocks to the A&P. I was getting used to the 3-flight climb of stairs to my apartment and was doing just a little too much. My head was filled with plans, long-term like buying major furniture, and short-term like eating a nice meal at the restaurant around the corner. I needed a little more cash for my expenses so I went to an ATM machine after lunch. I hit the usual buttons and had an odd experience when the machine asked for my PIN number. My mind went blank. I’ve used that number at least once a week for over five years and under normal conditions I can hit the numbers automatically, without thinking about them. At this point, no number came in my mind. I said to myself, “Pretend you’re at the ATM in Fairhope.” I hit some numbers. The message came up, “You have entered an incorrect PIN number, Please try again.” I tried about five combinations of the numbers I knew had to be right, but I was still coming up dry. The shaggy-dog story goes on and on. I tried at least ten different ATM’s and was told by each that I was giving the wrong number. I took a break, thinking the right number would hit me if I stopped worrying about it. A number came to mind and I tried it, but it too was not right. I called the central office of the bank, gave them all my ID numbers and information and told them of my dilemma. The lady on the line was cordial and told me she could mail me my PIN. I said, “You’ll email it to me?” and she said they weren’t allowed to email the numbers but she would send it to me in the mail. I told her I needed cash immediately. She suggested I use the bank card at a big store like Wal-Mart and ask for cash back. Unfortunately there is no Wal-Mart in Hoboken (Got that, Fairhope readers?) so I tried the CVS. Apparently the message was out about my card number because at CVS, when the card was swiped, instead of coining money for me, the machine said BAD READ and I couldn’t even use the card to pay for the paper towels and Clorox in my cart. On the phone, my daughter promised to bring extra money for me when she came the next day. By now my stomach was churning and I was feeling more than a little strange. Some time about five in the evening I began to realize that I had overextended myself. I didn’t feel I could stomach a restaurant meal. Instead I went out into the cold again and bought a bowl of won-ton soup at a little Chinese place called Off the Wall, and a Coke – the old Southern miracle cure for anything. Except, apparently, whatever I had coming on. I felt strangely euphoric and nauseated at the same time. I didn’t know what the euphoria came from; I just thought it was the excitement of having made such an enormous move, but later it seemed to me to be connected with whatever was making me vomit everything that went into my mouth -- perhaps a brain-chemical reaction to a body on its way to a bad time. I set up the inflatable bed and attempted to sleep off my stress. However, the bed had a way of deflating itself every two hours or so, forcing me to get up and turn the switch to inflate it once again. This was okay since I had to get up every two hours and throw up, but I could tell this procedure would get old very soon. The next day the virus caused me to spend a lot of time sleeping. I decided to call the bed company and get the defective inflatable replaced – no problem, but I’m going to have a lot of nights of interrupted sleep before my mattress arrives. The next 24-hour period was spent with much time in the bathroom for other reasons than had been noted here. It wasn’t until a day later – yesterday – that my system was back to normal. The PIN number has yet to be found in my mailbox, the furniture will not arrive until Monday, and my Internet hookup cannot be made at least until then. This morning I was homebound awaiting the arrival of the man from the New Jersey gas company. Thinking the furniture was only going to take three days, I didn’t pack all that much, so as soon as the gas man came, around 1:30 P.M., I made my way back to Target in an attempt to buy enough to get me through. I expected to take a taxi home, but I also expected to get my PIN number so that I’d have enough to pay the fare. The PIN number didn't appear, and besides I didn't have all that much to carry. I needed a few extra towels, a scrub brush, unglamorous stuff like that -- and I wasn't that taken with the lamps and furniture at Target to justify buying in and finding some way to get it from Jersey City to Hoboken. My cell phone ran out of juice about that time anyway. All this is just par for the course of making such a big move. I’ve little or no control over anything. I’m spending most of my waking hours waiting or shopping for things I already have with money I don’t. But it’s not Hoboken’s fault. Hoboken is just what I wanted it to be – funky, charming, noisy, and convenient to Manhattan. All night long there is activity. There is a busy, zany energy in its bustle and in its friendliness. I am looking forward to the next adventure. But it would help if I could get my bank to shake loose some of the money I put in there. I wonder what that number is.